First, heartfelt congratulations to Dr Andrew Higgins upon receiving his Ph.D. for his thesis, The Genesis of Tolkien's Mythology. Eglerio! A laita se! It is perhaps telling of Tolkien's status, that it is his dropping off the list that makes the headline. I am not sure that this is a problem, actually – without knowing the quality of many of the books that have made the list, The Hobbit is, in my opinion, not a particularly good children's book (read Astrid Lindgren if you want good children's books! ), and Tolkien's other works for children (Roverandom, Mr Bliss, Letters from Father Christmas, etc.) are not well known. in which Daniel Helen goes a bit deeper into the numbers and find Tolkien: e.g. with The Lord of the Rings in sixth place for the 9 - 11 years old. As a very handy service to those seeing out Tolkien conferences. Most are in the US, but there's a few in England as well, and the Deutsches Tolkien Gesellschaft's conference in Aachen in May. I haven't yet given up entirely on getting to Oxonmoot this year. Anna Smol lists a couple of conferences without a specific Tolkien track / area that I have decided to omit from the list below. An art exhibition in Milan. With a Tolkien track organised by Robin Reid. One of the wonderful things about other people knowing about one's interest in Tolkienian matters is that they'll forward things they think I would like to see – and often they are exactly right. Somehow I cannot imagine Tolkien, author of You & Me – and the Cottage of Lost Play, as being opposed to his work (and its various derivatives) being used to aid an argument drawing the lines between the imaginative engagement involved in the Secondary Belief of the adult reader and the play of child. As Douglas Anderson has noted in his Annotated Hobbit, the story in Carpenter's biography about Tolkien buying the post card with Josef Madlener's picture, Der Berggeist, on his 1911 trip cannot be true, because the picture wasn't painted until much later. But when was it produced as a post card? And did Tolkien really see this picture anywhere before creating his Gandalf character? This is the topic of this blog post by John Rateliff, which is followed by an interesting discussion. Overall it seems to me that David Bratman has the right of it – regardless of when the post card was produced, it seems more likely that Tolkien misremembered than that he saw this picture anywhere before inventing his Gandalf character. Sayers, Dorothy L. (2012-07-31). Gaudy Night (Lord Peter Wimsey Mystery Book 12) (p. 373). Open Road Media. Kindle Edition. In Sayer's book this is extended to apply to all scholarly pursuits, and this focus on the methods of the scholarly pursuits of knowledge is one of the things I do like about this book (Tolkien, famously, did not like it, though he had liked the preceding Peter Wimsey novels). Needless to say, I do agree with this, and as Joseph Pearce, regardless of the particular context, wishes to be seen as a scholar of Tolkien, I think such errors are indeed problematic. As for the remainder of the article, it has little to do with Tolkien, and is more about Joseph Pearce's views about tradition. This is not necessarily uninteresting, but if you seek insights into Tolkien, it is poor fare. This is a very interesting discussion that takes as its starting point the small story about Aulë's creation of the Dwarves. It is, perhaps, a bit surprising that McIntosh doesn't bring into the discussion Ilúvatar's earlier admonition of Melkor – the one with “no theme may be played that has not its uttermost source in me, nor can any alter the music in my despite” – which seems to me to play on the same themes as McIntosh' discussion here. Had it not been for such other references, I think it could be argued that McIntosh takes the text about Aulë and the Dwarves a little too serious, but as there are other ideas that seem to resonate well with this idea, it becomes more difficult to dismiss it. In her Talks on Tolkien series, Anna Smol has reached Michael Drout's excellent lecture on ‘How to Read J.R.R.Tolkien’, which she juxtaposes with the Old English poem The Ruin. I wish I had something intelligent to add to that, but I can only add my encouragement to go watch this – all of it! A series of Mythgard Academy classes focusing on “Tolkien’s first attempt to develop and integrate his great tales,” and on ‘the radical shift in Tolkien’s thought that began to take place around the time when he abandoned the Lost Tales”. These classes are tuition-free and publicly available. 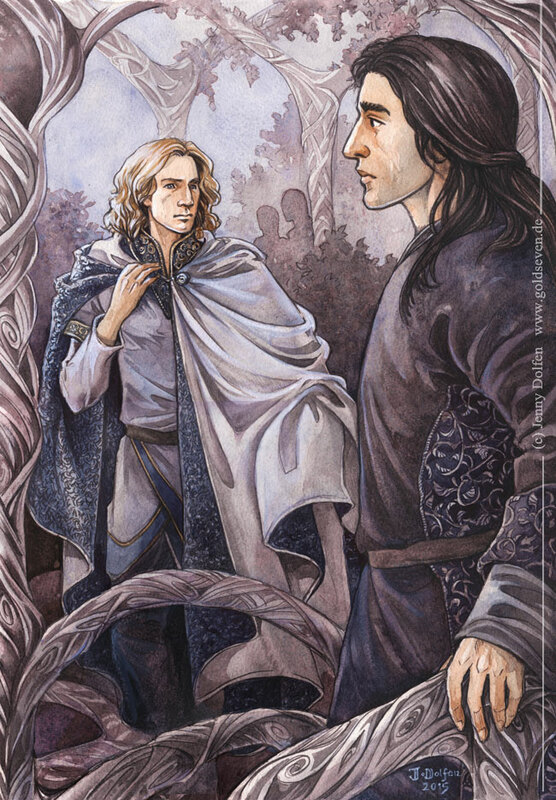 A fresh look at the love story of Nimrodel and Amrod of Lothlórien, and some educated guesses at possible sources. Timed, of course, for Valentine's Day, this charming piece is nonetheless also interesting and based in solid scholarship. A recording of Janet Brennan Croft from Oklahoma State University. Part of a series on marking the centenary of the Great War, the talk focuses on Tolkien's war-time experiences, but also branches out to his experiences in the Second World War. I hadn't seen this before, so thanks a lot to Anna Smol for sharing it! The talk about Tolkien is juxtaposed with excerpts from an interview with George R.R. Martin, whose war was the Vietnam war, which he didn't fight in. Having watched the video with John Garth from the 2014 Oxonmoot, I recommend also watching the interview with John Garth that was made at that Oxonmoot as well as the video made for King Edward's School. This paper presents itself as “fourth in a series of independent papers that considers England’s lost mythology” ... need I say more? On why Tolkien (probably) was not the first writer to use the word ‘quisling’ in English as a term for a kind of traitor against one's country. The opposite (i.e. that Tolkien was indeed the first to do so, specifically in his lecture On Fairy-stories) has apparently been claimed somewhere (Bratman politely abstains from naming names), but it is so unlikely that it deserves to ignored. Apparently the statement contained in the headline could be regarded as debateable, though, to me, it appears closer to a truism than to a debateable statement. Even books that have been adapted i such extremely iconic films such as e.g. The Wizard of Oz have produced again, and regardless of what one might otherwise think of Bakshi's, Rankin & Bass', Jackson's and other's efforts, none of them have the quality of being definitive (in the way that Brian Sibley's radio play has, so far, proven the definite adaptation of its form). The amount of dissatisfaction with all of these adaptations of The Lord of the Rings among readers of Tolkien, while obviously far from universal, is enough to highlight that there is more to be done about adapting Tolkien's epic romance as live-action film. That, obviously, does not have to mean that I am looking forward to this, but in some ways, I think that there is, for those of us who love and study Tolkien's life and work, an argument to be made for this being a case of ‘the more the merrier’ – the more adaptations, the more the Tolkien's books will stand out. A charming mix of personal reminiscing about an early devotion to Tolkien, and commentary on Bakewell and Sibley's radio play adaptation of The Lord of the Rings. I cannot decide which aspect is best – do read it for yourself and I hope you will be as charmed as I was. Some brief comments on ten new books related to Tolkien (if one counts the e-book single by Simon J. Cook). A couple of these books are parodies, which is not really something I have managed to develop a taste for (apart from that which arises in conversations in various fora and is funny in the situation). I am pleased to see Rateliff sharing my sceptic approach to The Hobbit Party, which seems to me to belong in the category of oddball or strongly projection biased books that Rateliff occasionally reads (he acknowledes the “seeking out and reading a series of oddball books on Tolkien” himself, and these tend to often display a very strong projection bias to some favourite, usually crackpot, idea of the author's – lumping The Hobbit Party with these, however, is exclusively my own judgement based on what I have read about it, including what I have read by its authors). The list of contents for the new volume on Tolkien and women, Perilous and Fair: Women in the Works and Life of J. R. R. Tolkien, edited by Janet Brennan Croft and Leslie A. Donovan. Being rather busy lately, I haven't got around to buying this one yet, but I am looking very much forward to the reviews, and it is already high on my wish list. This is the extended version edited by Verlyn Flieger and containing Tolkien's charming and wonderful essay about Smith of Wootton Major and the nature of Faëry in general. If you don't have the original edition of this work, make sure to get this one! Possibly the headline is just a bit of an exaggeration – I seem to remember hearing that there were other people involved as well. But John Howe's quiet and humble nature manages to escape through the filter of the interviewer, making for an interesting interview whenever John Howe's words are quoted verbatim. February's theme at John Howe's web-site has been trolls, and Grame led the Tolkien-related trolls with a pen-and-ink illustration of the troll of Sam's song. And here is the above troll done up nicely with paint. Jenny Dolfen is back in Middle-earth!! Hooray! 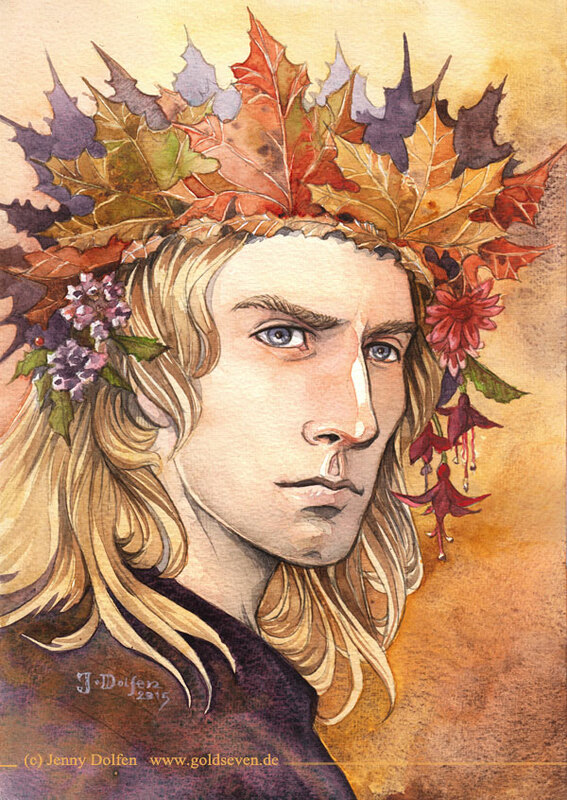 Though I do love her Darkness Over Cannae, I also do find Jenny's Middle-earth paintings more enchanting. Jeroen Bakker takes the reader on a tour on through the world of music inspired by Tolkien's work. Bakker clearly knows his subject very well (though I would personally put all authorised works that set music to Tolkien's own words in the same category of ‘Music from within the legendarium’ – but then I am not so terribly impressed with most of Donald Swann's compositions for The Road Goes Ever On) and gives a good indication of the scope of music that has been associated with Tolkien (both in terms of genre and ... shall we say, actual engagement with Tolkien's work). A collection of audio and video of talks on Tolkienian topics. The text to Kristine Larsen's paper for the 49th International Congress on Medieval Studies – Kalamazoo 2014. Unfortunately it seems that the linked PowerPoint is not available. Archive of posts from February 2015. The Southfarthings are still working their way through The Lord of the Rings with many interesting and thought-provoking comments along the way.